This lesson takes a different approach to the phrase "memory drawing". Typically, when we think of a memory drawing, we obviously think of drawing from our memory. In this lesson, the approach is different. Instead, the goal should be to create a drawing that represents a snap shot of a memory. This should be accomplished through creative photography. The students will compose a photograph that represents a recent or distant memory. The resulting image should be used as a reference for the finished drawing that will completed in graphite. Overview and Purpose: To expose students to the proper use of photography to create expressive photo references that can be used in the creation of drawings. Materials: Digital camera, photo manipulation software, graphite, white drawing paper. Objectives: The student will learn how to communicate a memory through an expressive graphite drawing. The student will learn how to compose photographs that can used as reference material for a completed drawing. Delivery of info: The teacher will discuss memories with the students and point out that sometimes our memories are filled with segmented images. The teacher will point out to the students that drawings and paintings can communicate the essence of memory if the imagery is also segmented, telling only a partial story to the viewer. Guided Practice: Students will list memories that they have and site specific images that come to mind when they think of them. Students will brainstorm ways to compose photographs that may communicate the memory in a partial sense to the viewer. The students will take photos and may choose to alter them using a photo manipulation program such as Adobe Photoshop. 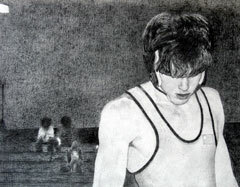 The photographs will then be used to as reference material to complete a graphite drawing on white drawing paper.